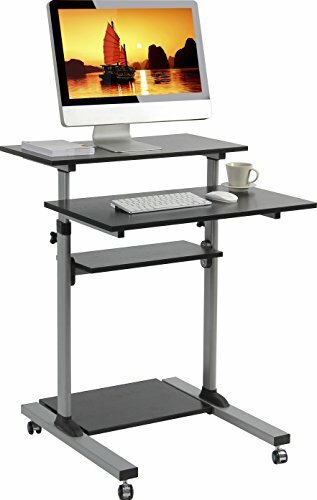 W1R by ONKRON is a new stand up mobile workstation that perfect for business and educational purposes. Ideal for use it in your office, classroom, showroom, conference hall or at home. Thanks to a great variety of adjustments you can achieve the highest level of comfort - you can vary the height of the workstation from 37" to 54". Changing between sitting and standing during a long work/study day ensures important health benefits for the body. It can be easily adjusted by thumb screws anytime. No need to use any tools. It comes with 4 platforms, which can be used to store your monitor, laptop, keyboard, printer, PC tower and speakers. High quality steel frame with powder coating provides durability and reliability. Rotary knob lock ensures securely positioning of different height settings. Workstation cart is equipped with 4 caster wheels so it is easy to maneuver to any location; two of them can be locked to prevent the cart from accidental rolling. Due to heavy-duty and durable construction - the maximal load capacity of this desk is 132 lbs. Mobile workstation comes with all needed hardware and a comprehensive product installation manual. If you have any questions about this product by ONKRON, contact us by completing and submitting the form below. If you are looking for a specif part number, please include it with your message.